Wait, what? How can something free be priced for $1.00 ? Easy: today Communion of Dreams, which normally sells for $4.95, is completely free for anyone to download. Please – go get it, if you haven’t already. In fact, if you have already gotten it, delete that one and go get it again anyway. Why? Well, it’ll help my rankings if you do. But I’m doing this today to help promote the Kickstarter for my next book: St. Cybi’s Well. Currently the Kickstarter is just a bit under halfway over. It is also just a bit under halfway to the funding goal. So far, so good. The thing is, though, that only 28 people have backed the project so far. Now, I love the level of support from those backers, and greatly appreciate the contributions. But so far this year over 20,000 people have downloaded Communion of Dreams for free. And the previous version of the novel had been downloaded over 35,000 times. If each and every person who got the book for free just this year would kick in $0.50 — fifty cents — no, not him — we’d surpass the Kickstarter goal and I could concentrate on getting St. Cybi’s Well finished and published. Go over, kick in a buck on my Kickstarter. Just $1. Tell others about it. Word-of-mouth is excellent promotion — it’s how some 60,000 people have heard of Communion of Dreams. Now, let’s convert some of that into support for my Kickstarter. Self-publishing is incredibly powerful. But it is also damned tough. There’s no ‘advance’ from a publishing house to allow me to concentrate on writing the next book. There’s no budget for advertising and promotion. There’s no design department handling the cover and book layout. There aren’t editors to go through the text. There aren’t copy editors to pore through the proofs. All of that has to be handled by me, one way or another. Communion of Dreams has gotten praise from people around the world. And not just for the story. Also for the professional quality of the text. That takes a lot of hard work and attention to detail. I don’t mind that. I take pride in the finished product. But I could use your help. If you got Communion of Dreams for free and enjoyed it, please help me out today. It’ll help get St. Cybi’s Well out that much sooner. I didn’t watch it when it was originally broadcast, but I came to really enjoy and respect the science fiction series Babylon 5. It was intelligently written, well produced, and generally well acted. It’s now my ‘default’ evening viewing — we’ll watch an episode or two with dinner whenever we’re not in the middle of watching something else. As a result, I’ve watched the entire series through (as well as all the various movies and the short-lived spin-off ‘Crusade’) probably a score of times. And I still find things to appreciate which I hadn’t caught on previous viewing — there’s a reason it won two Hugo Awards while it ran. Michael O’Hare passed away last night. He will be missed. He picked up a meal at the airport and ate in the car on the way over to his office, relaxing and watching the city roll by around him. The car he was in threaded through the old suburban streets, past still vacant houses and the occasional empty lot. Following the great death of the fire-flu, many homes had simply been abandoned. ‘What was it?’ he wondered as the car wound through the streets, stopping before the USSA building. He got out, standing there in the plaza, looking up at the golden plasteel supports and the draping glass fabric. As a writer, particularly of science fiction, you have to know what to explain and what to just assume. By this I mean you have to explain certain things to the reader, enough to give them a grasp on important story elements, but that you can assume they will fill in the background with other less important elements on their own. Nowhere in Communion of Dreams do I state that cars are largely self-driving. There’s really no need to. Most readers are used enough to the tropes of science fiction that they can read the above passages, and fill in that detail on their own. It’s a little trick which helps anchor the reality of the book in the mind of the reader quickly. GJELTEN: So the — I guess what — driverless cars have been in development for many years. But the big news this week is this law that passed in California allowing some driving of self-driving cars. Tell us what’s in this law exactly. LEVANDOWSKI: Well, this law is called SB 1298, and it sets forth the framework for the DMV to set up the guidelines that vehicles will need to adhere to in order to, in the future, be able to drive themselves with or without people inside them. It outlines the type of technical standards, the types of insurance requirements. Everything that you would expect a person to go through when they get their driver’s license, you would expect a vehicle that doesn’t have a driver in it to be able to have. From JK Rowling’s interview on “Morning Edition” today. Which is a surprise. Because I don’t usually become attached to things. Oh, I keep some things for sentimental value, because they are somehow connected to an important person or event in my life. But otherwise I tend to be very pragmatic about material things. I got the car new 20 years ago. A Subaru wagon, which served me well. The last five or six years when it needed work I would weigh the pros and cons of getting the work done — was it worth it? Could I afford it? Could I afford not to? See, I don’t *really* need a car. I work at home. For a while now when I needed to drive any distance, I took my wife’s car anyway, since it is a few years newer and in substantially better shape. This past spring it developed some exhaust problems. The work it needed was more than the car was worth. I decided the time had come to just sell it and be done. Consolidating down to one car for the household would be a minor annoyance, but made the most sense. Well, I made the intellectual decision. The emotional one, I found, wasn’t quite as easy. I owned, and drove, that car for more than half the time I’ve had a driver’s license. There was simple ‘time in harness’ associated with it. But there was more. Specifically, status. I don’t worry a lot about status. As in, conventional measures of “success” in our society. When you don’t make a lot of money, you learn to not put so much store in such things, or it’ll drive you completely nuts. And as I noted earlier this year, I don’t make a lot of money. But confronting the hard truth that I can not afford to buy a new car was a bit more than I really wanted to face. And selling my car meant exactly that. Because in our society, if you sell your car, you’re supposed to get another one. Preferably a new one. At the very least, a newer one. To not do so means you’re not successful. And you should never, ever, under no circumstances, admit that you’re not successful. So, yeah, the emotional truth was harder to come to terms with. Which would mean that I would be piss-poor at selling my car — at advertising it, at negotiating a sale, all that stuff. But I’ve come to realize that there are other approaches to defining success, other strategies which can change how you accomplish things. My Kickstarter project is one such, stepping in to crowd-fund what a conventional publishing contract would previously do. So I asked my wife to take care of it. She didn’t have the same emotional baggage to contend with. And she took care of it in her usual competent & efficient manner: last night the car drove away from our driveway for the last time. Who knows? Maybe next year, after St. Cybi’s Well is done and available, it’ll be enough of a hit that I’ll be able to afford a new car. One which can partially drive itself. Stranger things have happened. Just ask JK Rowling. Gee … where have I heard that question before? Hmm … perhaps in Chapter 9 of Communion of Dreams? “Paint it red? You mean the Moon? Unsurprisingly, Monroe concludes that the laser pointers wouldn’t accomplish the task. But then he uses that as a jumping-off point to explore what it *would* take to accomplish the task. And then some. It’s a fun piece, and likely the image of his I posted above has just become another instant classic, not unlike this one (which is the not-xkcd-approved Official T-shirt of BBTI). 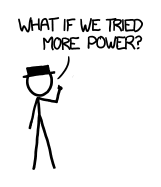 PS: Thanks to the people who sent me a link to the xkcd What If? entry this morning — very much appreciated. Now, if anyone would like to pop by the xkcd forums and mention this connection, I’d greatly appreciate it. Cheers! (Phys.org)—Former and current USC Dornsife physicists have led a study that represents the first, quantitative account of the universal features of disordered bosons—or quantum particles—in magnetic materials. The study published in the Sept. 20 edition of Nature magazine broadens our understanding of quantum mechanics and challenges the accepted predication in quantum theory. Yeah, OK, so? What’s that actually mean? Quantum magnets and other occurrences in quantum mechanics could set the stage for the next big breakthroughs in computing, alternative energy and transportation technologies such as magnetic levitating trains. Gods, I love that movie. “Alwyn, wait up, bud,” said my wife, as our dog trotted past us on our morning walk. He went a couple more paces, but stopped before he got to the entrance of a care facility. That entrance comes off a busy street, and we only want him to cross it with us so as to keep him safe. Well, well, well. Some things to share. A brief word about the Kickstarter’s progress so far, one week since launch: things are going well. We’re over $2,000 on pledges so far, from 20 backers. People have been contributing at levels from $5 to $500 — much appreciated! I’m a bit surprised that no one has just contributed at the $1.00 level so far, since that’s usually something which gets attention on Kickstarter projects where people just want to say “thanks” for some previous efforts or lend a bit of encouragement for a favorite author or artist. But that’s OK, if people want to pledge at higher levels, I’m not going to complain. Somewhat related to this, there’s a special drawing which may be of interest to those who are ‘into’ firearms — all the details are over on my BBTI blog. I also want to give a head-up: Next Sunday (Sept 30) will be another promotional day for Communion of Dreams, when anyone will be able to download the Kindle edition of that book for free. You don’t even need a Kindle – they have emulators for just about every mobile device, reader, or computer system. Tell your friends! Spread the word! *With apologies to Mr. Zimmerman. It’s been a while, how about a little “paleo-future” fun? Frank R. Paul was an illustrator of US pulp magazines in the science fiction field. He was born in Vienna, Austria… Frank R. Paul was influential in defining what both cover art and interior illustrations in the nascent science fiction pulps of the 1920s looked like.